Aaron Melon, Trumpeter, encourages students to build a lifelong love and appreciation for music and the arts. He works to foster confidence, responsibility, and discipline in students in their musical studies and beyond. Aaron picked up the trumpet on a whim in elementary school and found his passion. 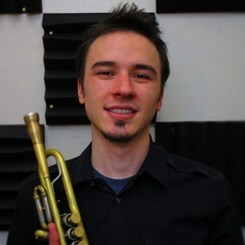 He is a recent graduate of Metropolitan State University of Denver with a Bachelors of Music in Jazz and American Improvised Music Trumpet Performance. While at MSU, Aaron participated in a wide variety of MSU Denver Ensembles including: Big Band, Jazz Combos, Mariachi Los Correcaminos, African Drum and Dance, Wind Ensemble, Symphony Orchestra, and The CU Denver Claim Jumpers. Aaron has also studied at the School of Improvised Music in New York City, and the Clifford Brown Jazz Trumpet Consortium in Delaware.